There are many different classifications in para-athletics. 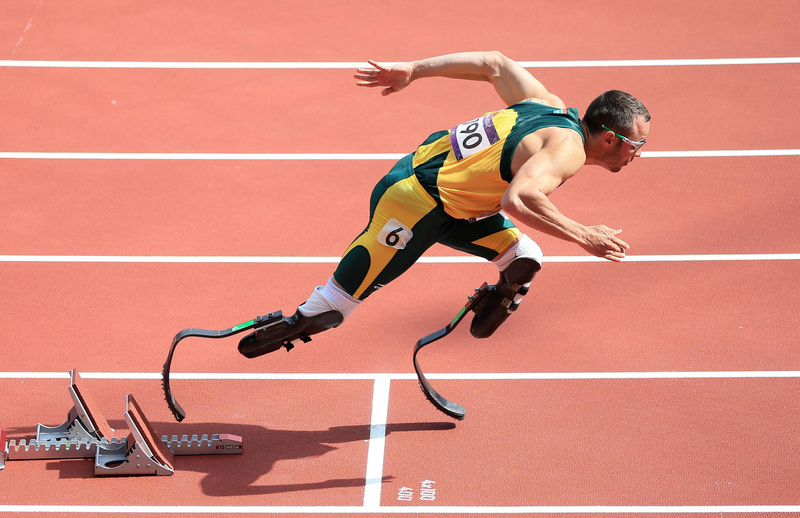 As it pertains to "assisted" running, the relevant classifications based on "the things Oscar Pistorious wore, bionics, etc." are T42(1) ("single above knee amputation"), T43(2) ("double leg, below knee amputation"), and T44(3) ("single below knee amputation"). NOTE: the T42 and T44 classifications include "impairment comparable to an amputation." Oscar Pistorious is classified as T44. Taking men's and women's 100m dash world record times among these classes, the fastest time recorded is 10.57 seconds in men's class T43(4), which is approximately an average speed of 21.16 miles per hour over a distance of 100 meters(5). Taking men's and women's 200m dash world record times among these classes, the fastest time recorded is 20.66 seconds in men's class T43(6), which is approximately an average speed of 21.65 miles per hour over a distance of 200 meters(7). The above suggests that the top speed that can be attained is slightly greater than 21.65 miles per hour. 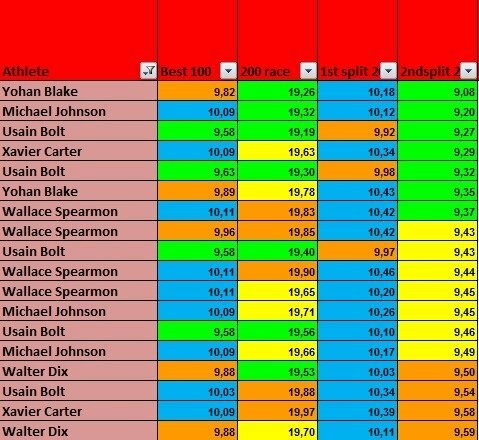 Using a crude estimation, subtracting the 100m world record time in men's class T43 from the 200m world record time in men's class T43, the difference is 10.09 seconds or approximately an average speed of 22.17 miles per hour(8). However, this graph as it pertains to unassisted running shows that the second 100m split from the 200m world record in men's class T43 can be less than 10.09 seconds, suggesting that an even higher top speed can be attained. Unlike Usain Bolt's men's 100m dash world record time of 9.58 seconds(9) as it pertains to unassisted running, I was unable to find 10m splits for the 100m/200m dash in men's class T43 or other records/history to further determine a top speed for assisted human running. The paralympic records site has a nice selection for recalling records based on event type, men and/or women, and record types. Not the answer you're looking for? Browse other questions tagged trivia running or ask your own question.